Today I want to wrote and show you a video about the first terrorist state in the Middle East, now with nuclear weapons, Israel. I got an A* at history at school, it was one of the only lessons I paid attention in as it fascinated me and my teacher would talk about conspiracies, real history covered up by the MSN and I studied World War 1 and World War 2 and the JFK assassination. Now you can go straight to the video and watch Black Stone Intelligence go through this bit by bit but if you have been reading my site you will know I have many historical documents on here related to the World Wars including the famous talk given by Benjamin Freedman, an ex Zionist Jew, who gave a very famous speech that put a very different spin on the reasons for WW1 and WWII. You can read the transcript and listen to it here. We should all know by now that the Rothschilds control most things, pulling their puppets in parliaments and state houses all over the world. They also run most of the central banks in the world where they can print money on worthless paper, lend it to the government, and our taxes go to paying back these usury loans. However there modus operandi has always been to make money from war. They lend loans to both sides and then collect reparations from the loser and the payback from the winner. Israel is a Rothschild operation, created between the British who were fighting the Ottoman Empire in WWI and Germany who was winning the war. Germany offered to call the war off with no reparations, lets just all go home and forget about it, and they were winning. The Rothschild's didn't like this as it meant no money from reparations and they went to the British Government and promised them that they could get the USA into the war and win it. However in return they wanted some form of document that gave them Israel. The famous Balfour agreement was a document sent to Lord Rothschild that promised to create a land for Zionist Jews if they brought the Americans into the war and in 3 months after the German offer to call the war off there was a total turn around in the USA who wanted to stay out of European wars. Most of the American press actually supported the Germans . A false flag attack on the British ship the Lusitania, which was carrying Americans to Liverpool from New York orchestrated by the First Lord of the Admiralty, Winston Churchill, got the Americans so riled up they wanted revenge and joined in on the war and beat the Germans. When the Jews started flocking into Palestine they committed mass murders, massacres and drove hundreds of thousands of Palestinians out of their homes. The rules of war say that refugees must be able to return to their homes but Israel, who had lost about 250,000 - 500,000 people in concentration camps, became the Nazis who had persecuted them. Killing and murdering British and Palestinians until the Brits left and Israel was created. 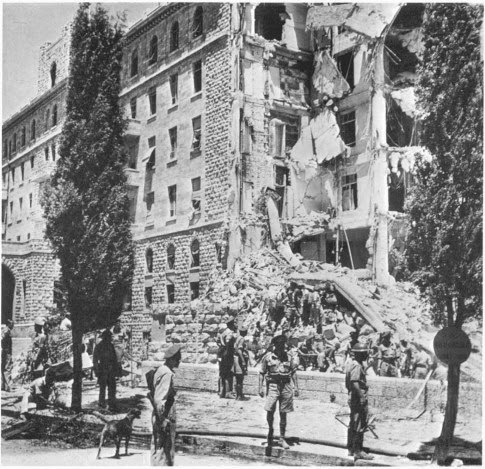 This of course caused more massacres, heads chopped off and of course the famous bombing of the King David Hotel, pictured above, which was the British HQ in Palestine. Remember that when you go to Auschwitz you are visiting a Russian rebuild version of the camp as when they came across it they knocked it all down. The design of the gas chambers is all wrong, and the Zyclon B, people claim killed the 6 million Jews is not found on the walls of the rebuild gas chamber but only in the place inmates were sent to be shaved to remove the lice that infected the camp. If you really try hard enough the guide that takes you through the camp will admit that it is a reconstruction. This famous picture of a stack of skinny bald dead Jews is not actually from gassing but due to the lack of supplies getting to the camps during the end of the war and lice infections causing outbreaks of Typhus which killed German guards as well. It would have been much easier to get the Jews to dig holes and then shoot them and fill the holes up than gas them, which they did do. However gassing 6 million Jews is not feasibly possible due to a modern cremation of a body taking 2-3 hours as you can read here. There would not have been enough time to do it especially as during the end of the war fuel needed to burn bodies would have been diverted to army brigades for tanks. Therefore the few ovens that are on show at Auschwitz would not have been able to burn all those bodies. First the gas would have to clear from the room before other Jews removed the bodies one at a time and burnt them in old fashioned ovens. Even Auschwitz has reduced it's numbers of deaths down a number of times to about a million. There were even stories of 6 million Jews at threat of death in Eastern European pogroms before WW2 and even WW1 as you can see from these pictures of papers. Notice the number 6 million and the date of the paper 1931. 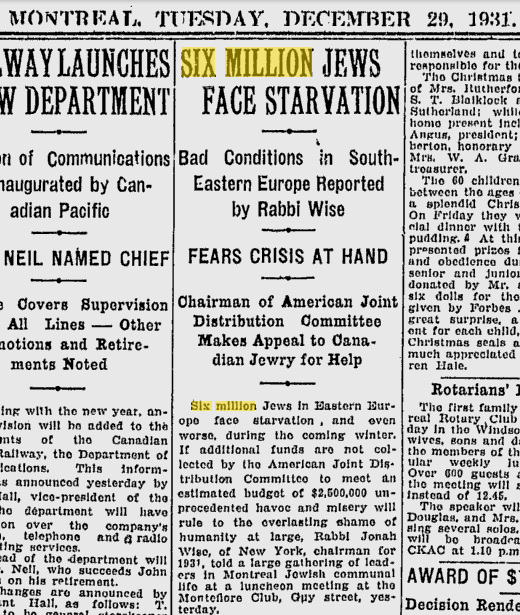 Read this article for even more than a hundred references to 6 million Jews before WWII. It seems to be a special number for them, as the Holocaust has been used as a pole to bash anyone on the head, and even imprison people who deny 6 million people died. Even an Israeli tried to get the names of all 6 million dead Jews and couldn't get more than a few hundred thousand. Hitler actually wanted to stand with the rest of Europe and fight the Jewish Communist Soviet Regime together. The fact that a lot of these communists were also Jews confuses things as well. 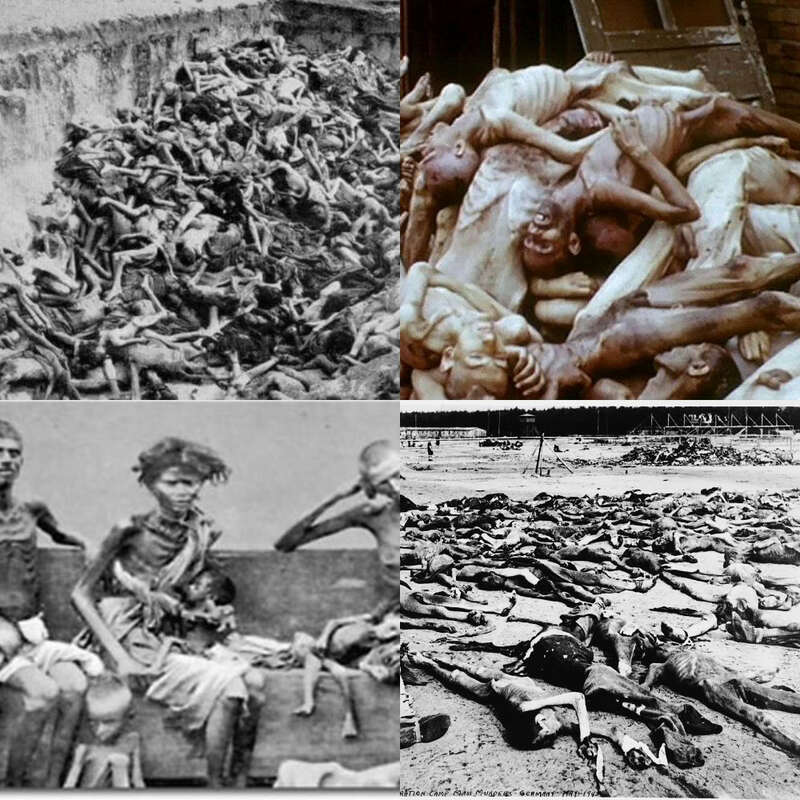 Were they killed for being communists or for being Jews? I am not saying Jews at labour camps were not killed, the weak, the old etc. However I don't think the Germans would have designed the gas chambers as they now stand, as a theme park for every world leader and school kid to go to, and say "never again". Now the Stern Gang and Irgun gangs of Israeli terrorists who killed so many Palestinians and British, American and other nationalities in their fight for independence all became members of the IDF. So the IDF is the Jewish army and it's based on terrorists. In fact the first leader of Israel was the head of a terrorist group and there have been 3 Presidents or Prime Ministers who were in these terrorist gangs. There is too much too go into this subject without being called a racist, anti-semite or have haters in the comment section. However history is history and it repeats itself over and over. Remember you can be a Jew and not Israeli or Zionist and you can be a Zionist and not a Jew or an Israeli Zionist atheist. The politicians call for the mothers to be killed so that they can't spawn any more Palestinian "snakes" and the racist language in the Knesset is appalling. Remember if you agree Israel is a terrorist state, causing false flag attacks to blame on Muslims like 9.11 or the USS Liberty or the Lavon Affair where they bombed Brits and Americans in Eygpt to blame on Muslims then you have to be scared that they have nukes, especially when you read the Samson Option. This was a policy of aiming nukes at Russia and Europe in case they were overrun by Muslims so they could take the whole world down with them, terrorists or rational players in a dangerous area of the world terrorising the Palestinians, Syrians and Lebanese? I will leave it to Black Stone Intelligence to go through the whole history and you can find other articles which prove Israeli IDF and Mossad soldiers are terrorists. They commit assassinations overseas, killing innocent Iranian scientists just in case they were working on a nuclear bomb, kill peaceful protesters on the Mavi Marmara in international waters like pirates, threaten the world with nuclear annihilation, and they have had many, many massacres of the Gazan people who have just had their only lifeline of food cut off by the terrorist state. Watch and comment please however do not call me an anti-Semite, which is the usual tactic to discredit someone attacking Israeli foreign policy, as I have nothing against Jews, just the Zionist State Of Israel. By Dark Politricks - Read on the main site and please help with donations or visiting "sponsors" as you read the article.